In the week of the 27th of February, I had the privilege of working in the Knysna Estuary and connecting with the people involved in the Knysna Basin Project. As part of my M.Sc degree I look at the proper identification of the Moonshine worm in the Knysna Estuary. 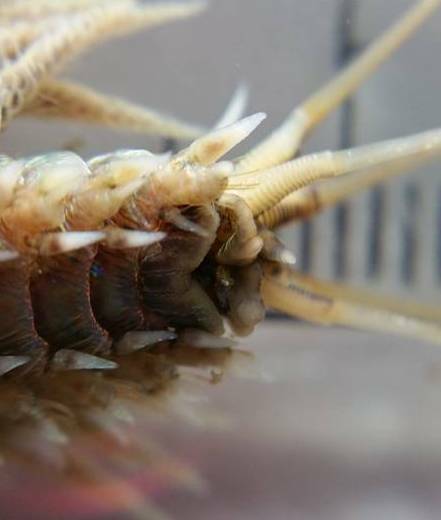 On-going interviews with local fishermen and published data suggest that polychaete worms are increasingly being harvested and utilized as baiting species in the Knysna Estuary. It is, however, not known whether harvesting of polychaetes is sustainable or how the apparent increase in utilization by recreational and subsistence fishermen may affect stocks. These problems are compounded by widespread confusion over proper identification of some species. Figure 1: Typical chimney on the Knysna moonshine worm. Figure 2: Another typical chimney of the Knysna moonshine worm. Figure 3: A moonshine worm sitting in the top part of its tube after smelling food outside. Since the first baiting survey conducted in the Knysna Estuary in the 1990s, there has been an increased utilization of what is locally known as the moonshine worm. The moonshine worm is a popular baiting species all along the Western Cape Coast of South Africa. However, the Moonshine worm in the Knysna Estuary is different species and genus than those found along the coast from False Bay up to St. Frances Bay. Previous reports indicated that these moonshine worms in Knysna might be one of two subspecies of more metropolitan species. Both however, have origins in the Northern Hemisphere and are therefore either alien species or these worms might be misidentified local species. Figure 4: One of the moonshine worms collected. We could not collect any whole specimens. Figure 5: ventral view of the anterior part of the animal. During this week, I spent time with local fishermen collecting samples and fixing animals in the Knysna Basin Project field laboratory, a beautiful “lab away from lab” that was well equipped for what we had to do. In the coming months, back at Stellenbosch I will be comparing what I found at Knysna with the specimens collected there previously which are stored in the Iziko Museum in Cape Town. I will also compare them to fresh samples from the Northern Hemisphere to see if these are indeed those species and if they are maybe a previously misidentified local species. Figure 6: Spiralling branchae, a defining trait of the Diopatra species. Figure 7: Dorsal view of the anterior part of the animal. I would like to thank Peter and Frances Smith as well as Louw Claassens for their spectacular hospitality towards us during our visit. It was great to share knowledge and findings with people who are so involved and care so deeply for the Knysna estuary. Guest post written by Hendre van Rensburg, a M.Sc degree student from Stellenbosch University.